Onto the midfield maestros then and plenty of good candidates. It is an area where Charlton managers have shopped well in the past 10 years, even Pardew who signed both Nicky Bailey and José Vítor Semedo. We began the decade with a midfield of Robinson, Newton, Kinsella and Stuart with Parker snapping at their heels. After promotion to the Premiership Radostin Kishishev and Claus Jenson were added. We end the decade with a midfield that cannot find a starting place for Therry Racon or Jonjo Shelvey, so in form are Nicky Bailey and Jose Semedo with Matt Spring proving to be an admirable alternative. In over 35 years of watching Charlton I have never seen a young player wear a red shirt as good as Scott Parker. It's simply a fact, whatever it was that turned his head at the end of 2003. All we know was the 23-year old's Charlton career was about to come to a shattering halt and with it our dreams of European football. What is also not up for any debate is that Parker's career was never the same after his spat with Curbishley, who justifiably put him on the transfer list following Chelsea's shall we say interest? Only at the start of this season (his 3rd with West Ham) did he match the the total amount of games played for us during his young days at The Valley. That is six years between Chelsea, Newcastle and West Ham and on top of that he has only added two full England caps to the one he got when with us. It's actually very sad. There was a lot of furore amongst Charlton fans, from me included, when he left, albeit for £10 million but when I watch the Hammers now I still feel an abundance of pride (and sadness) when I see him run from box to box like his life depends on it. I think the grieving has ended in regard to Scott Parker and I think we can all agree that he would walk into a CAFC Team of the Decade. 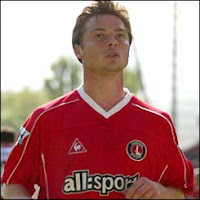 For many decades Claus Jensen was the kind of skilful player I'd never thought a Charlton team would have the luxury to include but the Dane gave us good service in our glory years, however perhaps 'Santa' saw the writing on the wall and moved onto Fulham in the summer of 2004. Jensen was never going to get his shorts too dirty but he used to stroke the ball around the park and had a wonderful range of passing. He could score goals too, 17 in total for us and many of them corkers. Jensen is now living back in Denmark after retiring due to injury and is writing music. It is a real surprise to me that Matt Holland has unwittingly hung up his boots this season. If there was ever a model footballer, then it was Matt Holland who spent six years with us during the decade after signing from Ipswich in 2003. Considered too small by Arsenal and West Ham's academy he began his career at Bournemouth and amassed 642 appearances until he retired this summer after a 20-year career. Holland was Mr Reliable and his loyalty shone through some dark days as we crashed and burned down the leagues. The vitriol I felt when Scott Parker left was nothing like I felt when Mr & Mrs Danny Murphy decided that The Valley wasn't Hollywood enough for them and decided to move upmarket for Tottenham's reserves in January 2006 after just 64 games. The signing of Murphy in August 2004 put me in some kind of parallel universe thinking we had made it. Signing Liverpool first team players (he played in 43 games the season before and also started for England)? Whatever next? Murphy's first season though was a bit of a struggle although he did score against Spurs in our 2-0 win in March but it was the season after that he really excelled. That was until Joanna Taylor (aka Mrs Murphy) realised she wasn't get invited to many film premieres. Murphy was never a Charlton player in the true meaning of the word but a list of our best central midfielders from this decade would be remiss without him. Mark Kinsella symbolised a Charlton team that burst into this decade. Curbs seemed to dally over his signature for ages but when he finally joined, the Irishman made an instant impact and just got better and better. Nonetheless Kins' best times for us playing were pre-2000 but he did lead us to our 2nd promotion in three years at end of the 1999/2000 season. The following season Kins was still first choice but Scott Parker was too good to keep out of the side and as Parker developed it was Kinsella's place that Curbishley decided to hand over to the youngster especially with him struggling with injuries. Kinsella's departure to Villa was swift, although one felt rightly as it proved, that his Charlton career was not over there. He managed a full season for Villa after Curbs sold him for £750,000 in the summer of 2002 and then dropped down to the Championship with West Brom at the age of 31 but was still a Republic of Ireland regular. You cut Mark Kinsella in half and he bleeds Charlton and that is more than partly what this series is all about but Mark's place in my Team of the Decade has gone elsewhere. I wanted to end my list with two from the current team as we end the decade with just 3 league defeats in the past 32 games. For a young man Semedo has spent time playing in Portugal, Italy and England and his calming imfluence and strong tackling has become a fixture in this season's Charlton side and his versatility was proven again at Griffin Park yesterday. A fit Semedo will play a very important role in the second half of our promotion campaign. Now for reasons that are not difficult to understand the bulk of my Team of the Decade is going to represented by players that were with us in the first half of the 2000's but I am going to spring a surprise and select Nicky Bailey alongside Scott Parker as the central midfield pairing in my team. Bailey's career says a lot about him as a person. Discarded by Fulham at 15, he started work in a local leisure centre, whilst turning out for Sutton United before moving up the non-league ladder to Barnet. Congruent to Kinsella when at Colchester, Bailey helped Barnet win the Conference title and then establish the Bees in League Two and as we found out earlier in the season he is still revered by their supporters. This is Nicky Bailey's 2nd season at The Valley but he already has an aura around him that suggests he has been around a lot longer. Last season in a truly atrocious team he scored 13 goals from midfield and swept to the most one-sided player of the year title for donkeys. This season, with players around him who now share his desire, he has put in some truly magnificent performances leading the team with the captain's band around his arm from the front. With another 9 goals already this season including the heavenly effort against Millwall, Bailey is easily the most potent goalscorer on the above list. He is also beginning to annoy opposing team's fans (Barnet aside) and in all manner of ways and that is always a very good sign. I don't know how long we can keep Bailey for, but already he has made a very big impression.